The data set provides estimated monthly and annual soil CO2 emissions for southern Africa (the SAFARI 2000 project region). The calculated emissions are from the respiration of both soil organisms and plant roots and are provided on a 0.5-degree grid cell basis. The data are a subset of a global data set (Raich and Potter, CDIAC 1996), reformatted and subsetted to the SAFARI region. The model (model B) used for these calculations was based on a stepwise linear multiple regression of individual aggregated records of geographically referenced data on daily and/or monthly rates of CO2 flux rates from intact soils, temperature, precipitation, potential evapotranspiration, vegetation type, soil moisture status, and organic carbon and nitrogen contents of soil. There are 14 data files in ASCII format (.dat) with this data set. This includes 12 data files (one for each month), one annual file of summed CO2 emissions, and one land-water mask. In addition, maps of the soil emissions are provided as companions in .gif format, one for each monthly file and one for the annual emissions file. Figure 1. Estimated annual CO2 emissions from soils in South Africa. 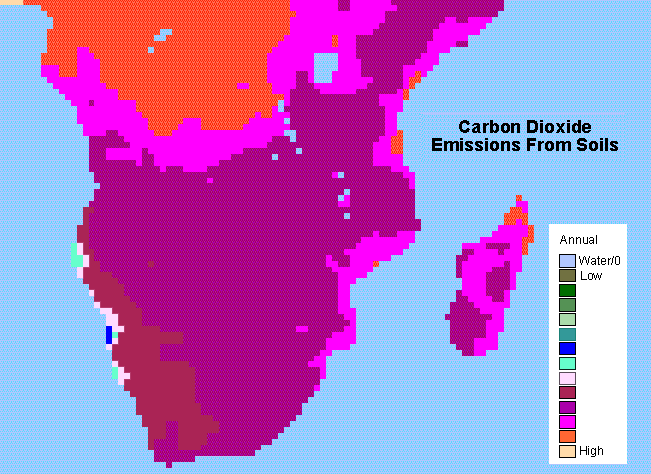 The data set provides estimated monthly and annual soil CO2 emissions from southern Africa. The calculated emissions are from the respiration of both soil organisms and plant roots and are provided on a 0.5-degree grid cell basis. The data are a subset of a global data set (Raich and Potter, CDIAC 1996), reformatted and subsetted to the SAFARI region. The Southern African Regional Science Initiative (SAFARI 2000) project was an international science initiative to study the linkages between land and atmosphere processes conducted from 1999-2001 in the southern African region. In addition, SAFARI 2000 examined the relationship of biogenic, pyrogenic, and anthropogenic emissions and the consequences of their deposition to the functioning of the biogeophysical and biogeochemical systems of southern Africa. There are 14 data files with this data set in ASCII format (.dat). This includes one land-water mask, one file of estimated annual soil CO2 emissions, and 12 files of estimated monthly soil CO2 emissions. The data are provided in units of 100 grams carbon per square meter of soil area. The data are on a 0.5-degree grid. Maps of the soil emissions are provided in .gif format, as granule companions, one for each monthly file and one for the annual emissions file. The FORTRAN code used to read the original global data files is also provided as a companion file and is available in the global data set documentation (Raich and Potter, CDIAC 1996). The first six rows in the files provide the number of columns, number of rows, x and y bounding box coordinates, grid cell size, and no data value. Data values begin on line 7. Figure 2. Estimated CO2 emissions for the month of May in South Africa. This is the data file companion safari_rpmodb_may.png associated with the data file safari2k_rpmodb_may.dat. These data could be of value in carbon cycle modeling. 1) To get correct latitude/longitude locations for soil emissions the predicted emissions were plotted over maps of vegetation types at the one degree grid cell level by Matthews (1985), and on the half degree grid cell level by Post et. al. (1996), and Olsen et al. (CDIAC, 1985). For the soil emission plots the 0.5 degree latitude band containing the Greenwich meridian and the 0.5 degree longitude band around the equator had to be skipped to achieve proper coastline alignment. 2) When Model B output per grid cell (g C/m2/yr or /month) was multiplied by grid cell area (m2) (calculated according to the program from the Goddard Institute for Space Studies (see IV)), and these products summed, total global soil emission was found to be 80.4 Pg C/yr while the published Model B value was 77.1 Pg C/yr (Table 1 & p 27 in Raich and Potter, 1995). Using the landmask information, provided by the authors, reduced the total global soil emission to 77.8 Pg C/yr. 3) The contributors of the model output (authors of the paper) were in agreement with CDIAC analysts about the necessity of reporting the above mentioned two points (Raich and Potter, CDIAC 1996). 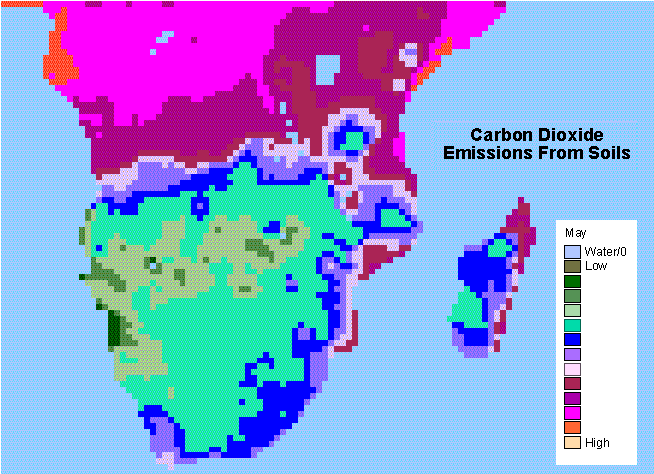 This data set provides estimated monthly and annual soil CO2 emissions for southern Africa (the SAFARI 2000 project region). The calculated emissions are from the respiration of both soil organisms and plant roots and are on on a 0.5-degree grid cell basis. The data are a subset of a global data set (Raich and Potter, CDIAC 1996), reformatted and subset to the SAFARI region. The methods used to derive the global data set are described followed by the method used to subset the data for South Africa. The model (model B) used for these calculations was based on a stepwise linear multiple regression of individual aggregated records of geographically referenced data on daily and/or monthly rates of CO2 flux rates from intact soils, temperature, precipitation, potential evapotranspiration, vegetation type, soil moisture status, and organic carbon and nitrogen contents of soil. These data points represent grid cells from every continent except Antarctica. Temperature and soil moisture status, as predicted by precipitation, were the only variables significantly correlated with soil CO2 efflux. Temperature and precipitation were, therefore, used as driving variables. The remaining model parameters for the mechanistic aspect of the model are (1) the soil CO2 efflux rate when temperature is zero and moisture not limiting, (2) the temperature coefficient and (3) the half-saturation coefficient of the precipitation function. These were obtained using least squares estimates with both Quasi-Newton and Simplex methods. To prevent extrapolation of the model beyond the range of observed temperatures, soil CO2 fluxes were presumed to be zero at average monthly air temperatures less than -13.3 degrees Celsius, and for all temperatures greater than 33.5 degrees Celsius, soil CO2 fluxes were set equal to the rate predicted at 33.5 degrees Celsius (Raich and Potter, 1995). The original (global) data were downloaded from CDIAC and the data were subsetted from this data set. Using GRID (a raster- or cell-based geoprocessing toolbox that is integrated with ArcInfo) the SETWINDOW command was used to define the subarea of interest which was defined by identifying the bounding coordinates: x_min 5 y_min -35 x_max 60 y_max 5. Matthews, E. 1985. Atlas of Archived Vegetation, Land-Use and Seasonal Albedo Data Sets. Goddard Space Flight Center Institute for Space Studies. N.Y, N.Y.
Olson, J.S., J.A. Watts and L.J. Allison. 1985. Major World Ecosystem Complexes Ranked by Carbon in Live Vegetation: A Database. NDP017. Carbon Dioxide Information Analysis Center, Oak Ridge National Laboratory. Oak Ridge, Tennessee. Revision 1 of this data set includes 13 companion files in *.gif format, one image for each monthly data file and one for the annual emissions data file. In the original version, these images were available only through a custom viewer. There were no changes to the emissions data or respective images - only a re-packaging of the images as companion files.